As a child, the magic of Christmas is the visit from Santa, but as an adult it’s a union of loved ones. Putting on a sumptuous feast for those closest to you is one of the best things about the celebration. Choosing the style and decoration is as much a part of the ceremony as the food itself so ani M INTERIORS has chosen five themes: vintage, opulent, frosted, traditional and rustic to inspire you. 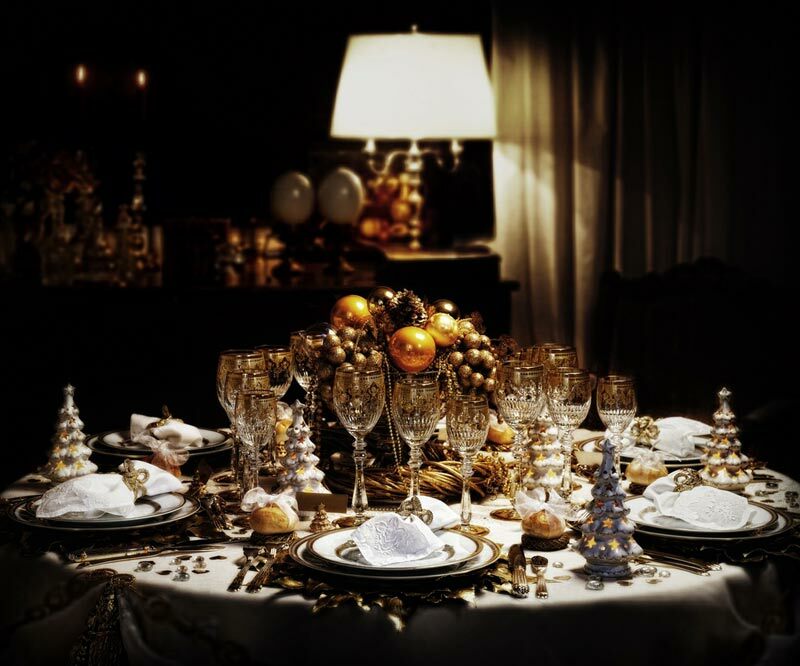 Here’s a four-step guide to dressing your festive table in show-stopping style. 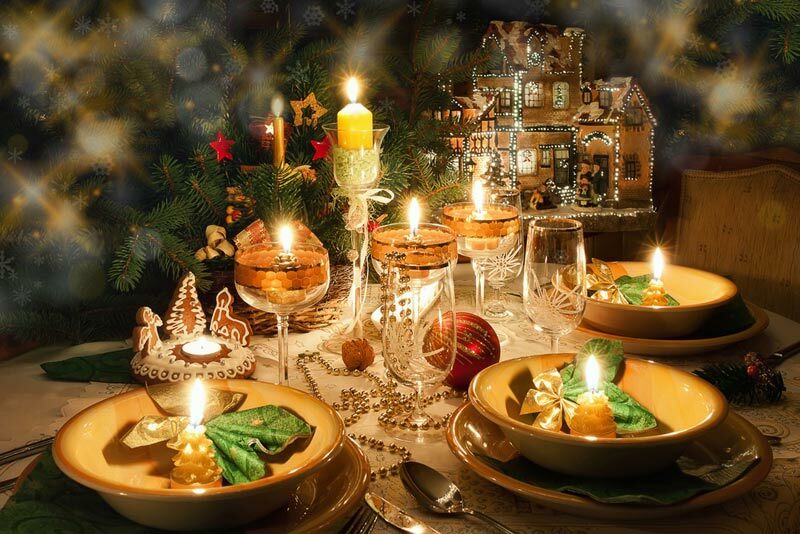 Good food, good company and good times, Christmas is for family and friends to share and make memories. So why not make the focus of the table personal mementos of times shared together such as old photographs to mark place settings and trinkets? 1 An old roll of wallpaper makes a great table runner decorated with candles of different heights and styles. 2 Unearth some fantastic vintage bowls, cups and decorations – part of this theme’s charm is that nothing has to match. 3 Compile trinkets, candles, baubles & pot-pourri in a decorative bowl for an eclectic centrepiece. 4 Add few handmade musical crackers to complete the look beautifully. Christmas is the best time for a bit of sparkle and as you are overindulging with the food and fizz then you might as well have a table dressed to reflect the indulgence. The key to layout is precision. Imagine a sumptuous sultan’s banquet with tiered platters of ripe fruit and rich food. 1 Embrace metallic shades of gold and silver to create a lavish look, blanketed on a luxurious satin tablecloth. 2 Cutlery, dinnerware, glassware and napkins should sparkle to create an instant feeling of luxury. 3 A decorative statement piece in the centre of the table is a great chance to get creative, layer gold and bronze baubles on a cake stand or try a bowl of delectable fruits dusted with edible gold powder. 4 Finishing touches include gold-dusted flower petals and place settings for your honoured guests. Seeing the first frost clinging to trees, benches and fence posts is part of the magic of winter. 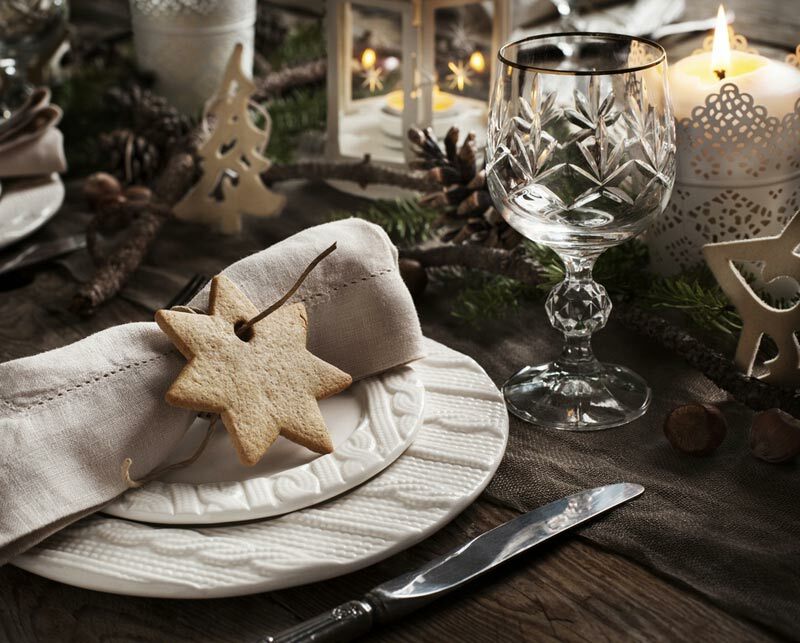 Recreate this look and make your table look as serene as fallen snow. 1 Crisp, white linen teamed with a silver satin runner forms the basis of this winter wonderland setting. 2 Sparkling crystal-cut glasses and polished silverware capture the light adding a modern elegance. 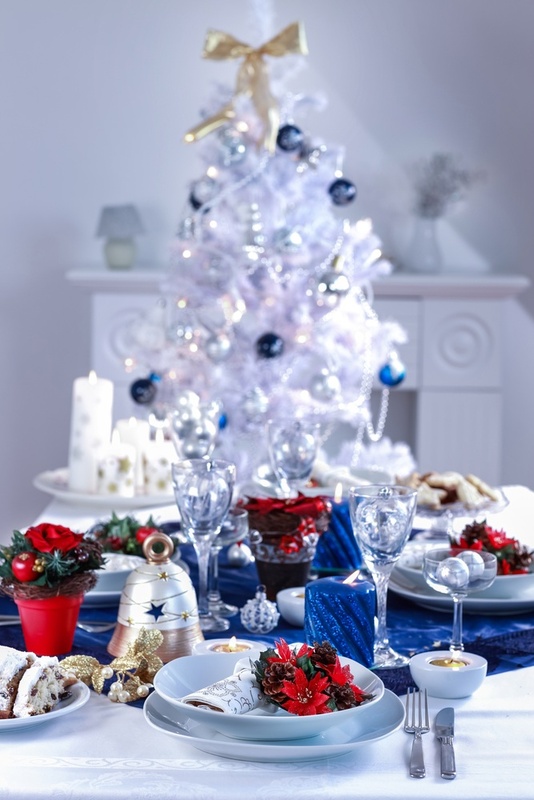 3 For a fun table centrepiece, set a miniature white Christmas tree adorned with small icy blue baubles. 4 Frosted berries and glittering pinecones are the perfect finishing touches to soften the ambience. Christmas colours are the berry red and bottle green of holly trees and the gold of church bells. What could be more traditional than this colour scheme at your table? 1 A delicate lace table cloth is the perfect backdrop to compliment the richness of these Christmas hues. Pair soft gold velvet ribbons as a delicate tie for your vibrant green napkins and placemats. 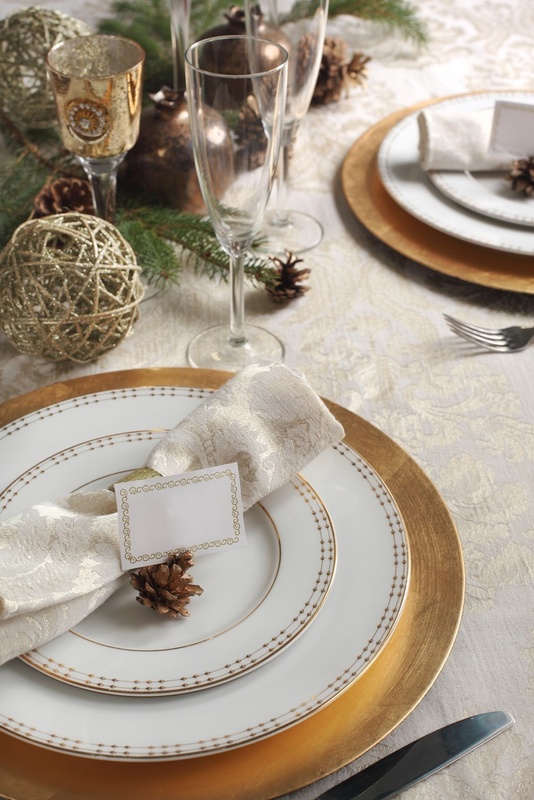 2 Bring grandeur to your dinner table with intricate, scroll edged cutlery and gold dinnerware. 3 A centrepiece of candlesticks wrapped with sprigs of holly and mistletoe adds a romantic touch and delicate winter fragrance. 4 Finish with scattered iced gingerbread decorations and small golden bells. The idea of enjoying Christmas in a beautiful farmhouse with a roaring open fire, home-grown food and nothing for miles but snowy fields has an enduring appeal. Recreate this rustic charm with your table decorations. 1 Natural beauty is key so bare the top of your dining table and use tree trunk cuttings as plate chargers – both practical and creative decoration. 2 Tie cutlery in bundles with natural jute for a modest elegance. 3 For a warm and inviting ambiance scatter candles amongst natural finds such as driftwood, pine cones, sprigs of holly and pine. 4 Place small, carved wooden stars engraved with your guest’s names for charming place settings to treasure forever. These five different ways to dress your table will wow your guests, especially if you embellish the ideas with your own personal touches.